The Sun is a major source of energy in our solar system which has lightened our life with its unlimited potential. While human beings have exploited its energy to heat their homes, cook their meals, and produce hot water. When heating a home wasn’t as simple as turning on the central air during ancient times, civilizations such as the Egyptians and the Greeks had to plan many months in advance, if not years to make their homes habitable during the winter. During the 19th century, we were still exploiting the Sun’s energy with simple passive solar water heaters using a simple black-painted barrel. It wasn’t until 1954 that the world saw its first silicon solar panel invented by Bell Labs and since then the world has changed drastically with further progress in solar panel technology. According to data from the International Energy Agency (IEA), the solar generation will elevate nearly 16-fold between 2018 and 2040. The future of solar energy looks bright due to the availability of cheaper silicon solar panels and a global push for clean energy sources to address climate change. The world only gets about 1% of its energy resources from solar; however, it is possible that in the next 30 years this percentage could skyrocket to as high as 27%. The solar energy systems such as solar farms and concentrating solar power (CSP) plants would become the world’s most valuable energy resource, generating more energy than fossil fuels, wind, or hydroelectric systems, as well as reducing carbon emissions by 6 billion tons per year! Urban areas account for nearly 70 percent of the world’s energy consumption today. This implies that they are responsible for 40-50 percent of greenhouse gas emissions. According to a European Technology and Innovation Platform report, around 80% of the Earth’s population could live in urban areas by 2050. This means that the energy consumption will double – or at worst, triple. Now the team led by Professor Hussam Jowhar of the University of Brunel (London), an inventor of the multifunctional Flat Heat Pipe, has developed a hybrid ready-made snap-together solar panels technology called ‘PVadapt’ that converts waste heat into hot water in a £10 million sustainable energy scheme starting next month. The excess heat of solar panels during harnessing solar energy which worsens the quality of the work and if the excess heat is not removed, the efficiency of the system will begin to fall until the panels cool naturally. Professor Jouhara has developed solar panel system in which two relatively simple, well-known technologies in combination with each other helped to solve a number of pressing problems, as reported by the University of Brunel (London). He placed a series of compact heat exchangers in the form of flat tubes between them, where they do not allow the direct and very hot rays of the Sun to melt the equipment of the station. Photovoltaic cells capture photons and produce electricity, water circulates through flat tubes and carries with it excess heat. It’s a very simple, Lego-like system of elements for assembling such hybrid panels of all sizes and profiles. This is a ready-made commercial product, cheap devices for all types of buildings that, in addition to electricity, will be able to generate hot water for their residents. “With our system, there is no waste heat. The approach focuses on low-cost, high-efficiency and modular prefabricated ‘Lego’-type construction elements for near-zero-energy buildings,” says Professor Jouhara. 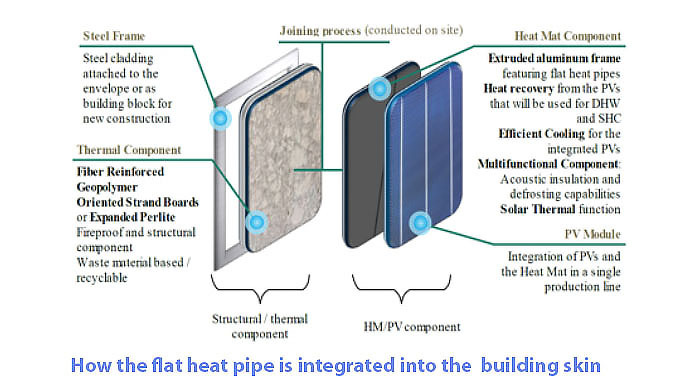 PVadapt will use heat pipes to cool the PV cells themselves to make them more efficient and longer-lasting. And the heat removed from the cooling is reused. Professor Jouhara and the Brunel team will combine all the different technologies into a prefabricated building integrated photovoltaic (BIPV) energy and thermal storage system of the future. 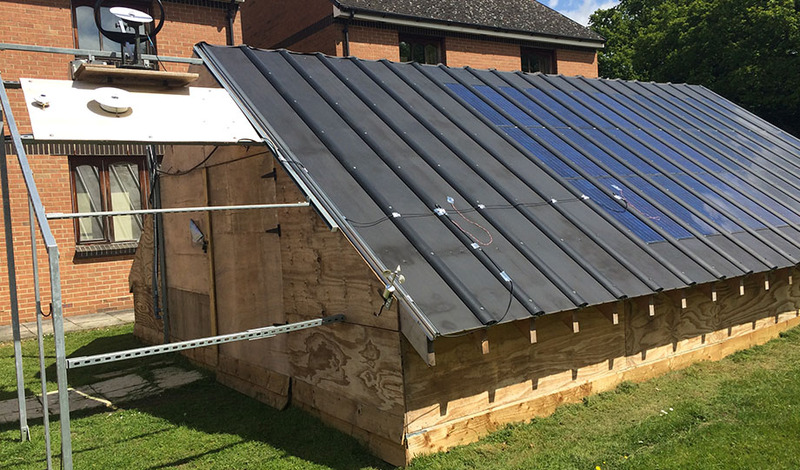 According to the University of Brunel (London), the £260-a-square-metre panels could be used in social housing, public buildings, and offices and even in developing countries and off-grid. And the prefab parts that only need snapping together on site mean buildings using PVadapt technology can go up very quickly.